One of the questions people have when they learn about sous vide cooking is, is it safe? 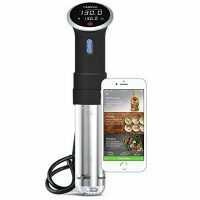 As long as you practice good food safety practices, yes sous vide cooking is very safe. 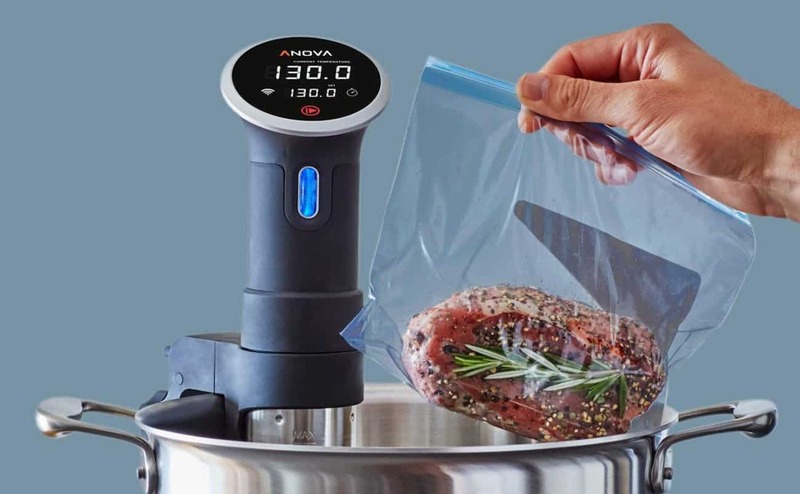 Sous vide food safety falls into two big questions, is it safe to cook food at lower temperatures and is it safe to cook with plastic bags? According to the USDA the danger zone for foods is between 40°F and 140°F. Your refrigerator should be set to a temperature below 40°F which keeps it in the safety zone before you start to cook with it. Once you remove your food from the refrigerator, it&apos;s important you not keep it between 40°F and 140°F for an extended period of time. Once foods start to rise above 135°F the bacteria will start to die off. 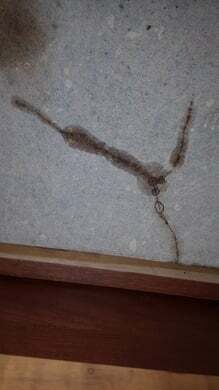 It&apos;s important to understand the bacteria don&apos;t suddenly all die off instantly, they die off over time. 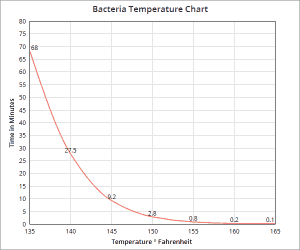 The amount of time it takes for the bacteria to die off is related to the temperature. The higher the temperature the less time it takes. 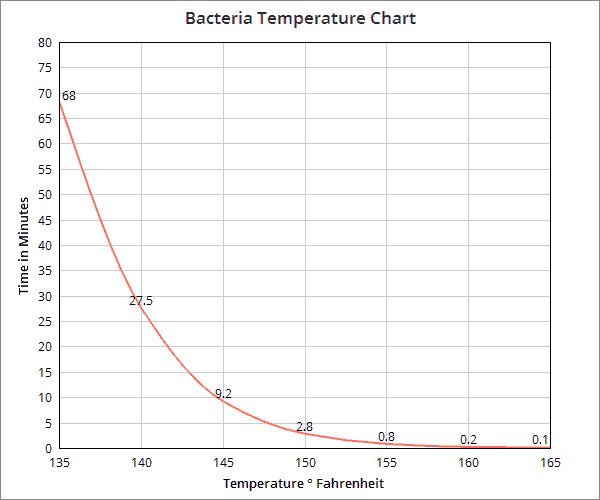 The accompanying graph gives a representation of how long it takes the bacteria to die off at each temperature. For more in depth information see the FDA website. When you cook sous vide your food will be placed in either a Ziploc® style bags or a Vacuum Sealer Bags. In 2012 the US Government banned any plastics containing BPA, so both styles of bags are completely safe to cook in. It&apos;s important that you remove any air from the bags you are cooking in so that the food is able to contact the inner wall of the plastic bag and allow the heat to pass to the food. A Vacuum Sealer is nice to have if you&apos;re going to do a lot of sous vide cooking, but it&apos;s not required. You can use the displacement method shown below to achieve results that are nearly as good. As we noted above it&apos;s important to practice safe food handling practices and use the proper time and temperature combination to allow the bacteria to die off. It&apos;s also important to understand placing a bag of meat in 160°F water won&apos;t instantly cook the meat killing the bacteria, the center of the meat has to reach that temperature before all of the bacteria is dead. If you are cooking fruits or vegetables, you can reuse the bag, provided you clean the bag properly first, a trip through the dishwasher is usually recommended. If you are placing raw meat inside the bag, you should discard the bag after cooking with it. It&apos;s possible for bacteria to survive in crevices, seams, and corners of the bag and you&apos;ll never be able to completely clean it out. At temperatures over 155°F, some lower quality Ziploc-style brands may start to lose their seal, something you should keep in mind if you aren&apos;t buying the name brand products. Ziploc® Brand bags have a melting temperature of 195°F. If you are going to cook at temperatures over 195°F you are going to need Vacuum Sealer Bags which are safe for temperatures of 212°F. Most sous vide cooking is done in the 140°F - 160°F range, which can be problematic if you cook directly on marble, granite, Corian®, Silestone® or any other natural or man-made stone countertops. You should never place a metal pot or cooking vessel directly on a countertop when you are cooking with your sous vide as it may cause the countertop to crack. Use a metal wire rack, trivet, hot pad, or other heat resistant object. If you are using a Cambro® style food container, you should never place it directly on the counter either. Depending on the temperature and the height of the "feet" on the bottom of the container, enough air may not flow underneath to dissipate the heat, causing the countertop to crack. Again you&apos;ll want to use a metal wire rack, trivet, hot pad, or other heat resistant object.